Deciding to hire a professional pool cleaning company is the best step you can take to maintain a safe pool. We will help you save your money and maintenance in the long run, and most importantly, make your weekends the most enjoyable moments. Instead of spending your weekend time on poolman’s duties, we want you to relax by the sparkling poolside. Make sure you talk to us through (925) 269-9399. The easiest way to keep a clean pool is by hand-skimming every day. Debris must be removed because they sink eventually and make things worse. To help protect your pool from future issues, we use skimmers or hand-held nets to get rid of floating debris, dead insects, and other unnecessary materials. Skimming is very important in improving the circulation efficiency of the pool. It also reduces the amount of chlorine required. On the other hand, strainer baskets require washing at least once a week. These baskets are used at the sides of above-ground pools and located at the pool decks of in-ground pools. To clean the baskets, they are simply shaken and sprayed using a hose pipe to dislodge the stubborn dirt and grease. We use the most efficient pool cleaners and vacuums like the robotic cleaners to ensure that your pool stays clean and crystal clear. A clean pool doesn’t need too much chlorine because its sanitation level is very high. Every time we vacuum, we check the filters to ensure that all debris and oils are washed off. Apart from vacuuming the pool, we recommend scrubbing the walls and brushing pool tiles on a weekly basis. This is something we specialize in and we apply the right techniques for the right pool. The methods and tools we apply depend on the type of wall. 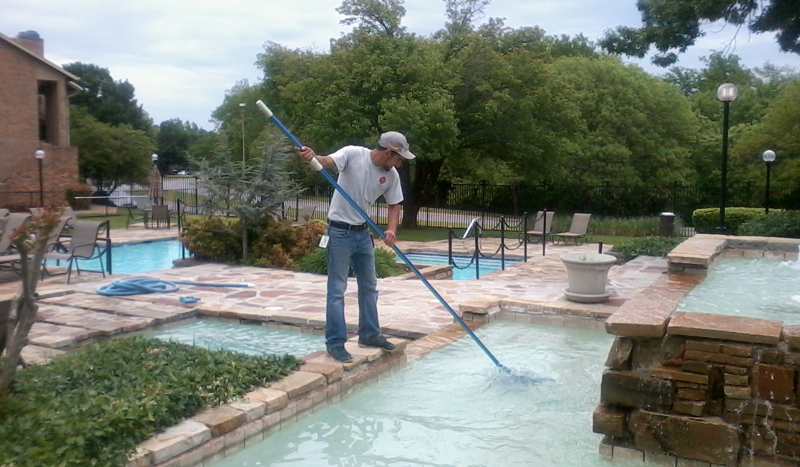 For concrete pools, we use stiff brushes while for fiberglass and vinyl liners, we only use soft tools. If you don’t have any knowledge on pool cleaning, don’t try it yourself, you should allow us to do the job for you. Brushing and scrubbing removes algae and excess accumulation of calcium. The tiles require soft brushing to prevent any degradation or scratches. For pumice stones, acids and putty knife works well. You must not allow in pool technicians into your property if they don’t hold a business license. A license is one of the things that make us truly professional. Without a liability insurance, you won’t feel safe with anyone working on your property. Insurance takes care of possible accidents that may happen during the service e.g. if a bottle of acid is knocked off and spoils the stamped concrete surface of the pool deck. In such cases, our insurance policy covers the damage. A lot of mishaps can happen and our liability insurance, whose coverage you must verify, will cover up for them. At Pleasanton Hill Pool Cleaning, we don’t leave any phone call unanswered. And as soon as we receive your inquiry, we act quickly and show up at your place sooner that you expect. We value our customers because they are the reason we have gained so much reputation. Our technicians ensure the best behavior because they want to earn your trust and you will rate them highly especially during the first time they work with you. Just like we answer service calls promptly, we do not compromise on quality of pool service be it scrubbing, vacuuming, or skimming. Customer service is our priority. Throughout Pleasant Hill, Hookston, Concord, Bancroft, Berkeley, Sparkle, Vine Hill, Moraga, Pittsburg, Walnut Creek, Four Corners, Martinez, and nearby towns, we are best known for our unsurpassed pool services. (925) 269-9399: Call this number if you need pool services.